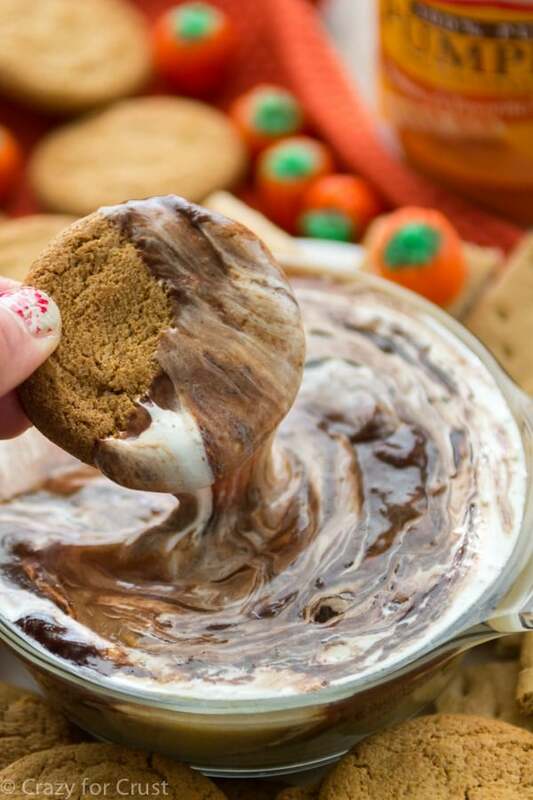 S’mores, pudding, and Oreos, all in one no-bake dessert! Oreo S’mores Trifle is an easy layered dessert recipe! Graham crackers, chocolate pudding, Oreos, whipped cream, toasted marshmallows and chocolate syrup all layered in a mason jar. This trifle is perfect for picnics or on the go! 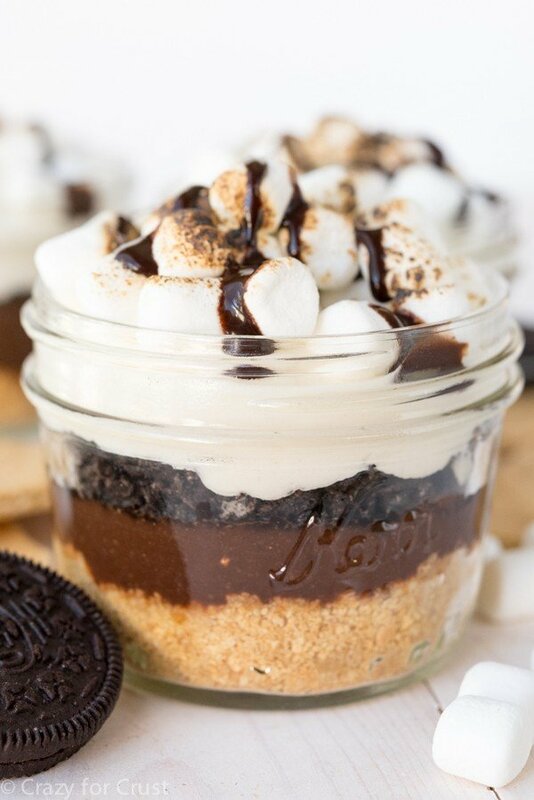 So…whenever I look at this Oreo S’mores Trifle, my head hurts. As amazing as the trifles are, they caused me to have a major accident in the kitchen. Set the scene: Late afternoon. I’m getting in one last shoot before I rush to clean the kitchen and relax. As I’m cleaning up the photo shoot area, the rolling pin I used to crush the Oreos starts to roll off the kitchen island. I don’t want it to hit the floor so I rush around to catch it. And then I tripped on the dog’s water bowl. And I fell – hard – on the wood floor. My knees were the first thing to hit, then my hands. I screamed “MY CAMERA!” which is what brought Mel and Jordan running. Ignoring the pain in my knees, I crawl over and grab the camera and take a few test shots of the dog. I sigh with relief – it didn’t break. And then I wonder why it didn’t break. I pulled it down off the kitchen island onto the wood laminate floor. That’s when my head started to hurt. And that’s when I realized why my camera didn’t break: it bounced off my temple before it landed on the floor. I still have the bump. And I still can’t kneel. But I did enjoy several Oreo S’more Parfaits over the next few days. Not sure if that’s a #win or not? So these parfaits are a super easy no-bake treat. I made them because I had a huge bowl of marshmallow whipped cream staring me in the face. I had made the Buttermilk Banana Pancakes the cream was designated for and then wanted to make something else with the rest. Obviously I thought of s’mores. I went over and over in my mind what to make when I realized I wanted to make something in a jar. Have you ever made dessert in a jar? They’re just so much fun. A trifle is what popped into my head next. I wanted it to be no-bake because it was 109° at the time. My oven is getting a vacation this summer. What’s in a trifle recipe? A trifle is just a simple layered dessert. This one has several heavenly no-bake layers! You just need a few ingredients: graham cracker crumbs, chocolate pudding, Oreos, and marshmallows. The best part about making a trifle is you can put it in any kind of jar or dish. I love using mason jars so they’re easy to pack for on the go. Or, use plastic cups for a picnic or party, like I did with my Tiramisu! First, you press the graham crackers (mixed with melted butter) into the bottom of the jars to form the crust. If you can’t find jars or don’t want to use them, use a drinking glass or small dish. Easy instant chocolate pudding goes on next. You can use packaged pudding for an even easier treat or make a from scratch pudding, your choice. I used a basic instant chocolate pudding. Mix it with milk, let it set up, then add it to your trifle. Next comes the Oreos! Crush a few Oreo cookies and sprinkle them on top of the pudding. Oreos + S’mores = S’mOreo! I topped my trifle with a healthy dose of marshmallow whipped cream, toasted marshmallows, and chocolate sauce. You can use either the whipped cream OR toasted marshmallows, or both. Use what you have on hand. I used a blow torch to toast my marshmallows but you can toast them over your stove or BBQ and then add them on top. 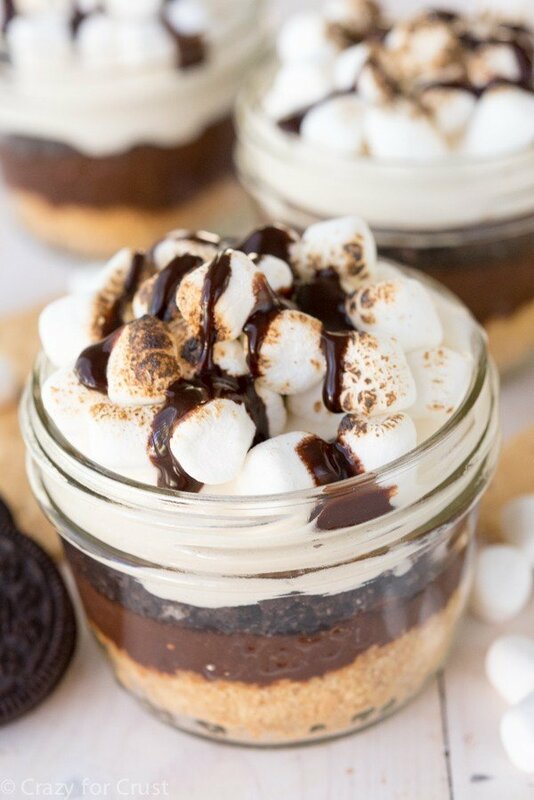 These Oreo S’more Trifles are perfect for a party, a picnic, or shoving in your face on a Friday night. Or all three! NO BAKE Oreo S’mores Trifles are the perfect way to use up graham crackers, Oreos, and pudding. Don’t forget the marshmallows to complete the s’mores! Just make sure not to chase a rolling pin while you’re making them. Oreo S'mores Trifle is an easy layered dessert recipe! 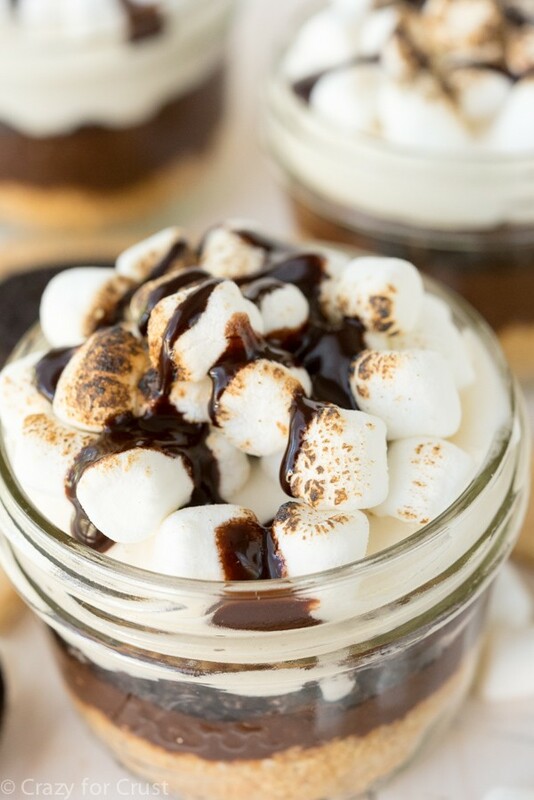 Graham crackers, chocolate pudding, Oreos, whipped cream, toasted marshmallows and chocolate syrup all layered in a mason jar. This trifle is perfect for picnics or on the go! Whisk pudding and milk in a medium bowl. Set aside to thicken for about 5 minutes. Stir butter and graham cracker crumbs in a medium bowl with a fork. Press into the bottom of 6 jars or serving dishes (1-cup size). Spoon pudding equally into jars. Top with crushed Oreos. Cover and chill until ready to serve, at least 1 hour. Before serving, add the marshmallow. You can use marshmallow whipped cream or add toasted marshmallows, or both. Top Oreos with whipped cream, top with marshmallows, and toast them with a blow torch. (Or just top the trifles with marshmallows you toast outdoors.) Drizzle with chocolate sauce. 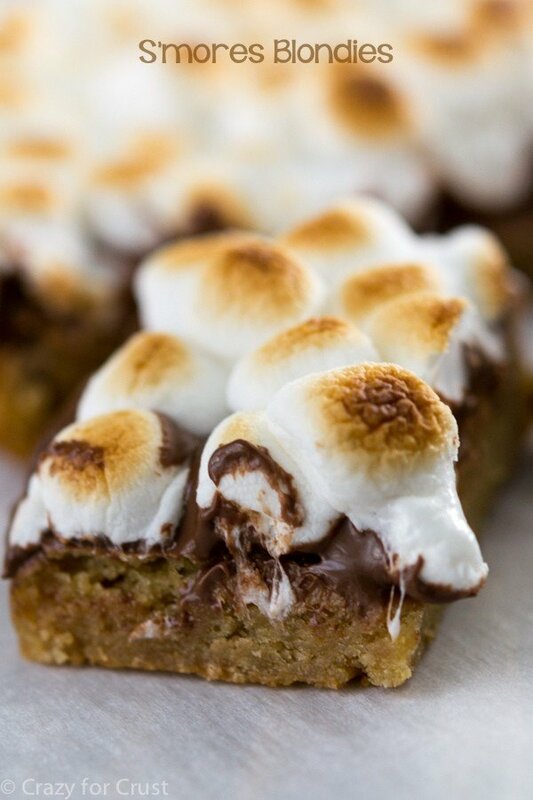 I love s’mores recipes in summer! 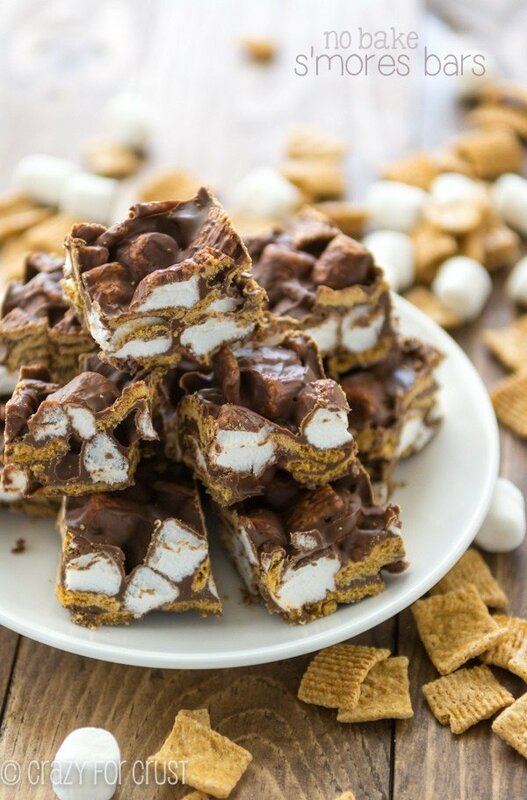 Try these favorites: No Bake S’mores Bites, S’mores Oreo Brownies or Peanut Butter Cup Stuffed S’mores Brownies! Amazing dessert, I loved. One of the best delicious recipe I’ve ever seen. Thank you for sharing this recipe with us.